One of the missing Imperial Fabergé Easter Eggs made for the Russian Royal family will be on public view for the first time in 112 years, at Court Jeweller’s Wartski in Mayfair in the run up to Easter. The magnificent Third Imperial Fabergé Easter Egg will be on view for four days only from the 14th April 2014, 11am to 5pm. Entrance is free, but queues are expected but it will be worth the wait as it is unlikely to be seen again by the public for a long time, if ever. The tragic story of the last Tsar and his family has been fascinating the world for almost a century and most people will immediately associate the iconic Fabergé eggs with the Russian Royal family. Only fifty of these lavish works of art were ever created, each of them a unique design and a certain mystery is attached to all of them. After the Russian Revolution the Eggs were seized by the Bolsheviks. Some they kept, but most were sold to the West in a campaign to turn ‘Treasures into tractors’! Obviously for the people! 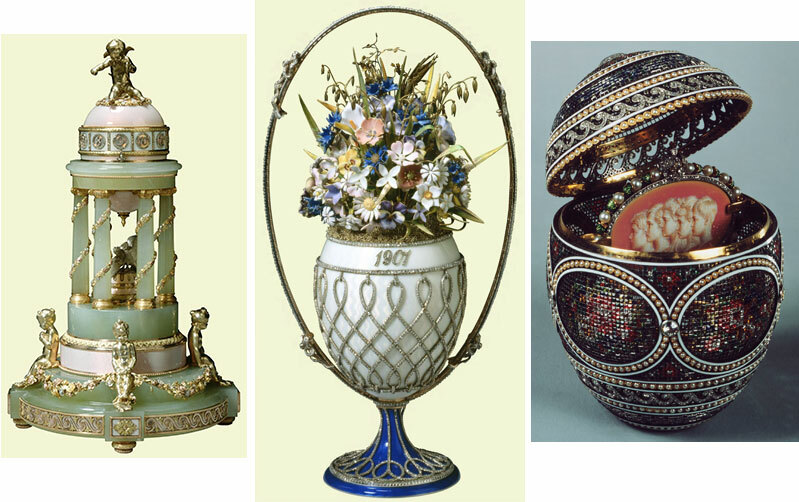 Three were bought for Queen Mary and are part of the British Royal Collection, the Colonnade Egg Clock, the Basket of flowers Egg, and the Mosaic Egg. The remainder belong to Museums, Oligarchs, Sheikhs and Heiresses. Eight of them, however, are missing of which only three are believed to have survived the revolution. So the discovery of the long lost Third Imperial Egg is very significant historically. It was given by Alexander III Emperor and Autocrat of all the Russians to his wife Empress Maria Feodorovna for Easter 1887. The jewelled and ridged yellow gold Egg stands on its original tripod pedestal, which has chased lion paw feet and is encircled by coloured gold garlands suspended from cabochon blue sapphires topped with rose diamond set bows. It contains a ‘surprise’ of a lady’s Vacheron Constantin watch with a white enamel dial and openwork diamond set gold hands. The watch has been taken from its case to be mounted in the Egg and is hinged, allowing it to stand upright. It measures a mere 3.5 inches high. Its whereabouts was still known in 1902 when it was last seen in public in Russia at an exhibition of Imperial Treasures in St. Petersburg and finally recorded in Moscow in 1922. It re-emerged again in 1964 when it is mentioned in a catalogue for Parke Bernet the New York auction house, later acquired by Sotheby’s, and described as a ‘gold watch in egg-form case’ . It sold for £875 to a female buyer from the Deep South. After she died in 2000 the egg somehow ended up at a bric-a-brac market. It was bought by a scrap metal dealer for £8000 for its scrap value but thankfully he was unable to sell it to make a reasonable profit, thus avoiding the tragedy of this lost Imperial egg being melted down for its gold content. Eventually after many years of this article just hanging around his kitchen, the dealer, with the aid of the internet and out of curiosity, googled, ‘Vacheron Constantin‘ and ‘egg‘ because this was the only identification that he recognised, obviously not realising what the Fabergé marks indicated, and came upon an article about this missing Imperial Fabergé Egg. 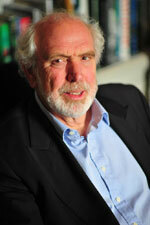 The rest is history, as they say, and this very fortunate scrap dealer is now better off to the tune of £20 million. This must surely be his ‘Only Fools and Horses moment’! That is his story, but The Vintage Magazine would like to commemorate this extraordinary discovery, by bringing to you the story behind the greatest Exhibition of the works of Carl Fabergé – Goldsmith to the Imperial Russian Court. 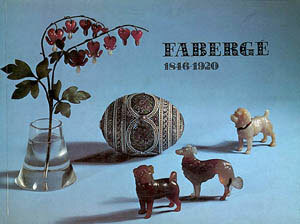 Robert Jarman, the founder and editor of The Vintage Magazine published the catalogue for the Exhibition held at the Victoria & Albert Museum, of The Works of Carl Fabergé, to celebrate H.M. The Queens Silver Jubilee in 1977. In 1976, aged 26, I formed a consortium of friends to acquire ‘Debrett’s Peerage & Baronetage’, from IPC Business Press for the princely sum of £25,000. It does not sound very much now, but in 1976 it was a lot of money, and having acquired this noble tome, we had to start coming up with some good ideas pretty quickly to make it profitable. My partner in Debrett, Harold Brooks-Baker, or ‘Brookie’ as he was universally known, had, through his friendship with Kenneth Snowman, the owner of Wartski, Jewellers by Royal Appointment to HM the Queen and HM the Queen Mother, had discovered that the V&A Museum were planning a major exhibition of the works of Carl Fabergé, to celebrate the Queen’s Silver Jubilee in 1977. We arranged to meet with Roy Strong, the then Director of the V&A to try and convince him to let Debrett publish the catalogue for this exhibition, and we quickly put a ‘dream team’ together to work on this publication, including the designer, Humphrey Stone (son of Reynold Stone, the famous designer of bank notes) and the printer, Julian Berry, of The Compton Press, which operated out of the Old Brewery at Tisbury in Wiltshire. Both Julian Berry and Humphrey Stone were sensitive to the demands of Kenneth Snowman and Roy Strong, both of whom were difficult people, and demanded perfection, so it was extremely important to have ‘a meeting of the minds’, which we did, most of the time! Fortunately, both Roy Strong and Kenneth Snowman were sympathetic to our approaches and granted us the contract which was a huge risk for them and a huge responsibility for us. The 1977 Fabergé Exhibition was unique because both the Queen and the Queen Mother, and HRH Prince of Wales had all agreed to lend pieces from their private collections for the first time, as these formed the core of the Exhibition. Malcolm Forbes of Forbes Magazine also agreed to lend a number of his stunning Fabergé eggs and other pieces from his collection. I was delighted to meet this extraordinary man who was a legend in New York publishing. I became friends with his son, Christopher, known as Kip, who shared his father’s passion for collecting and amassed one of the finest collections of Victorian art ever seen – but that’s another story for another article! The Exhibition was due to open on 15th June, and we were way behind with the design and layout, having spent far longer than expected getting all the material together, from Kenneth Snowman and the V&A, and elsewhere. We had also seriously underestimated the interest which was building in this Exhibition, skilfully orchestrated by Brookie and the V&A publicity department, so, by the time it opened there were queues right around the block on which the V&A stood, and it was the same story for the following three months of the Exhibition, until it closed on 15th September. Consequently, we had to order frequent re-prints of the catalogue, and in some cases we were delivering new batches as the previous printing sold-out. In fact, the attendance at the V&A, and the consequent demand for catalogues, was so huge, that we eventually switched the printing to other companies who were far better equipped to handle the larger print runs, and we somehow managed to keep the V&A supplied throughout the exhibition. Shortly after the exhibition opened, there were two, very special Private Viewings, one for H.M the Queen, and another for H.M. the Queen Mother, both of which we attended as the publishers. I thoroughly enjoyed meeting both great ladies, and sharing a few gin & tonics with them as we admired the Exhibition, and I answered their questions about the catalogue. The V&A had also arranged to have a very special limited edition of the catalogue prepared, using the finest leather binding, and with the official commemorative Silver Jubilee coin inset on the front cover. I treasure my copy as a fond memento of my first publishing success. It was a sobering thought that, within one year of acquiring Debrett here we were, having drinks with the Queen, and the Queen Mother in the imposing surroundings of the V&A having just published one of the most successful museum exhibition catalogues of all time, and there was more to come! The visitor numbers for this Fabergé Exhibition in 1977, were calculated at over 500,000 people over three months from 15th June to 15th September, and it still ranks as one of most successful exhibitions at the V&A, ever. As a result of the success of this exhibition, we published an impressive ‘coffee-table’ hardback book about Faberge, called ‘Carl Faberge – Goldsmith to the Imperial Russian Court’, by Kenneth Snowman of Wartski, and this also enjoyed considerable success when it was published in 1978, and added to our list of best sellers in the few years after we acquired Debrett, in 1976. The current Managing Director of Wartski is Geoffrey Munn, with whom I worked on the V&A Exhibition, when we were both young men making our way in the world. He is now famous for his appearances on the Antiques Roadshow, where occasionally a piece of Fabergé is discovered, much to his obvious delight. In the meantime, I have been granted a 20 minute private viewing of this extraordinary Imperial Egg at Wartski on 8th, April, which is a real honour, and probably reflects the minor role which I played in bringing the works of Carl Faberge to the attention of the Great British public, including this article. I urge you to go to the public viewing and witness this rarest thing of beauty, which may never be seen in public again.